At Hill People Gear, we like skis for traveling and snowshoes for working in the winter. 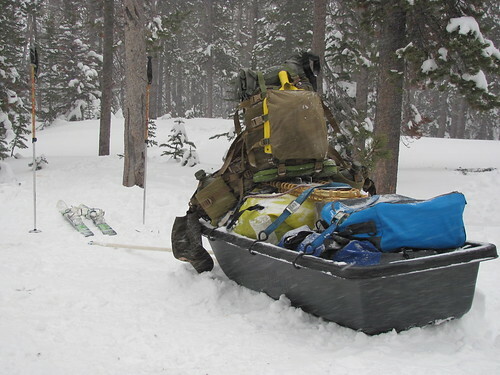 We also like simple general purpose solutions to backcountry problems. For that reason, we favor older style alpine touring bindings on our waxless backcountry skis. You can use any boot with a toe and heel welt and use DIN releasable settings to save your knees in a crash among other advantages. Swiss military surplus Fritschi FT-88 are the first choice, but Ramer bindings by Alpine Research are also readily available in military and civilian versions. Somewhere along the line we came across the original Alpine Research instructions for mounting, adjusting, and troubleshooting Ramer bindings. For those of you rocking Ramer bindings, here are the instructions. To download Ramer ski binding instructions, click here.